Default, disability discharge, bankruptcy, aggregate loan history statuses for federal student loans and overpayment status for federal student grants. If any of these items come up as discrepant, the Office of Student Financial Assistance is required to resolve the issue. This may require the Office of Student Financial Assistance to follow up with you to request documentation to resolve any of the eligibility issues referenced above. 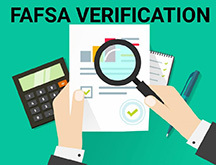 Verification is the process in which Student Financial Assistance (SFA) – as dictated by federal and state regulations – compares the information you reported on the FAFSA with your prior-year IRS Federal Income Tax Transcript, W-2 forms, and other financial documentation. 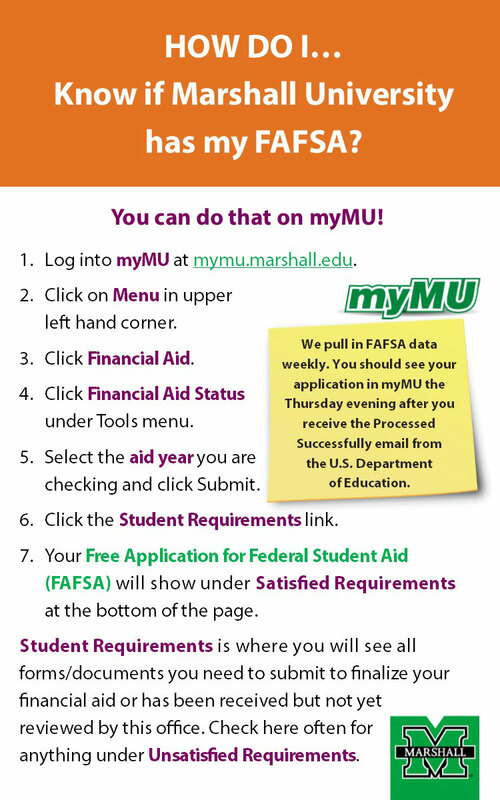 If your application is selected for verification, you will be sent a letter or an email instructing you to log onto mymu.marshall.edu to review your outstanding financial aid requirements. 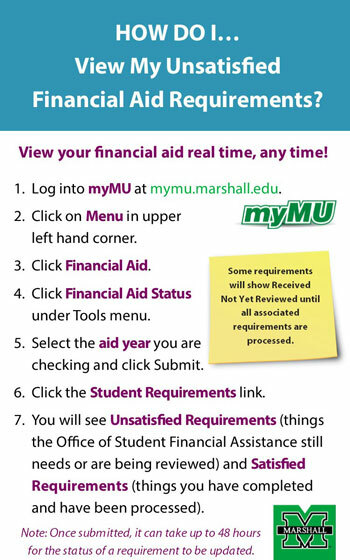 You will need your Marshall University User Name and your Marshall University password to access your records. From there you can determine the specific information SFA needs in order to verify your data. SFA must receive all requested documentation before your financial aid can be disbursed (or credited) to your Bursar account. If there are differences between the data you supplied on your FAFSA and the verification documentation you submit, corrections to your SAR may be needed, and your application will be reprocessed. 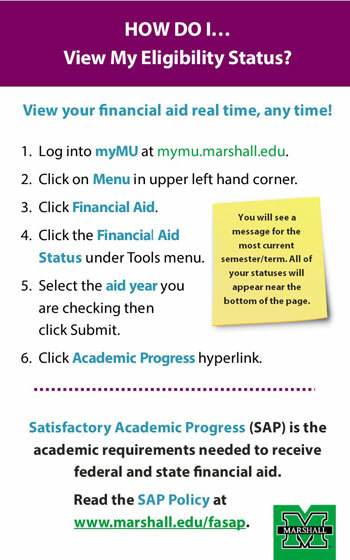 It is extremely important that you respond to requests for information promptly because finalized financial aid awards are processed in the order of file completion date. To ensure that your financial funds disburse as scheduled at the start of the fall semester, you must be registered for classes and submit all required documentation by June 1. You may still submit documents after June 1; however, you should be prepared to make payment arrangements with the Office of the Bursar in the event your financial aid is not finalized by the billing due date. The deadline for submittal of all verification documents for federal (with the exception of Federal Pell Grant) and state aid programs is 30 days prior to the end of the academic year/period you are enrolled. This designated deadline allows SFA to process and authorize disbursements within the timeframe permitted under regulations set forth for administering the federal and state financial aid programs. Failure to provide requested documentation within this timeframe will result in cancelation of your financial aid offers. The deadline for students to submit verification documentation may be extended up to 60 days after the student’s last day of enrollment during the academic year/period on a case-by-case basis, and will be processed to the extent that is administratively possible. A Federal Pell Grant applicant selected for verification must have any verification updates completed by the deadline published in the Federal Register. The deadline specified in the Federal Register for 2018-2019 is 120 days after the student’s enrollment or September 21, 2019, whichever is earlier. 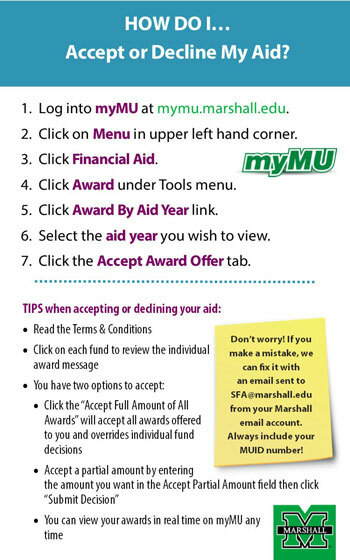 You will be sent an email directing you to review your revised financial aid awards by logging into myMU and accessing your financial aid records when there are any changes as a result of verification.